It’s that time of year when all the cold and flu bugs are circulating. 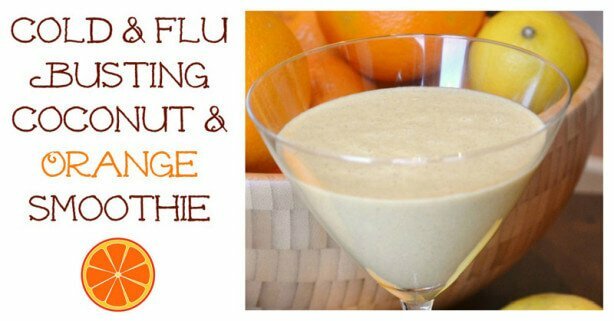 This cold and flu busting coconut and orange smoothie will stop your cold or flu in it’s tracks in no time. Since I started drinking smoothies every day 3 years ago, I’ve only had 2 flu type bugs. Both of those bugs surfaced when I was suffering from extreme baby related sleep deprivation. I used to get one cold after another all the way through each winter and spent a lot of my childhood in bed with the flu so I’m still amazed that a change in my diet can have such a positive impact on my health. If you drink smoothies like this one every day, you’ll do wonders for your immune system. If you already have a cold or the flu, this smoothie contains ingredients that will reduce the length of your cold, plus give you an easy to digest energy source that you will find easy to stomach.